June 21, 2012 • Heidi Shenk • "recipe"
It has been hot. And when I say hot, I mean the Baltimore kind of hot where there is so much humidity in the air that your skin pores can breath the instant you step out of the air-conditioned house. Combine the humidity with 95 degree, 99 degree heat index temps at 11:01am (yup, I'm writing this as we speak and have pulled up weather.com because I'm a weather nerd like that) and you are going to die when you walk out of that house. Well, you probably won't die, but it will at least feel like death until you are back in the A/C with an ice cold glass of water. Yesterday, I did what any normal and sane person would do-- I played softball in this kind of weather. I was standing in the dugout, yes, just standing, and I felt the sweat drip from my forehead three minutes into the game. I did not die, thanks to chugging three bottles of water that were readily available, but once I got home and needed to make dinner, I didn't want to move a muscle. These kinds of days happen more often than not in Baltimore. It is a shame because you know how much I love spending time outside. Luckily, believe it or not, our roof deck is the coolest place you could possibly find outdoors in this kind of weather. It has a nice breeze and the humidity is not nearly as bad. Plus there are usually no bugs. None of those awful mosquito bites! So what to do for dinner on a night like this? 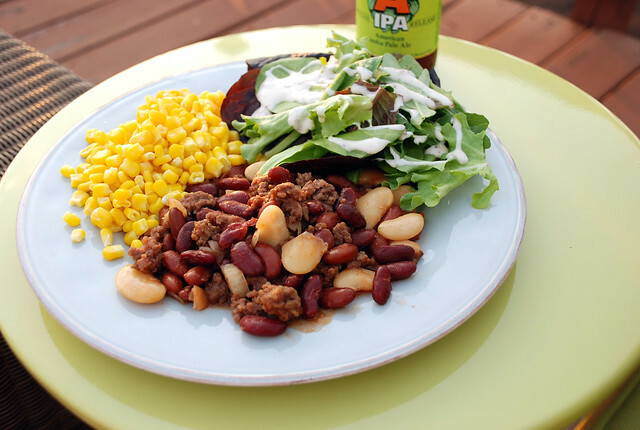 Crock pot it up early on in the day, cook some corn really quickly, throw some greens on a plate, grab a good ol' IPA and you have a delicious dinner on a breezy roof deck. 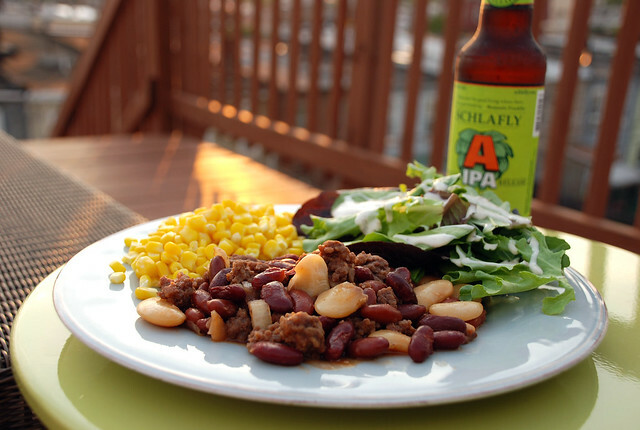 This was the perfect summertime roof deck dinner. The baked bean casserole is a super easy recipe that my mom used to always make. It's a recipe that you usually bake, but in an attempt to avoid the heat of the oven I decided to try making it in the crock pot earlier in the day. Best idea ever. It turned out just as perfectly and left me with the chance to be lazy and enjoy summer break while it simmered in the crock pot. Set your crock pot to high and cook for 2 hours. Stir the casserole and cook at low or warm until ready to serve. If you choose to go the baked route instead, mix everything in a casserole dish and bake at 350 for an hour. This casserole can serve as the perfect main course along with some other veggies, or as a baked bean side at a barbeque. 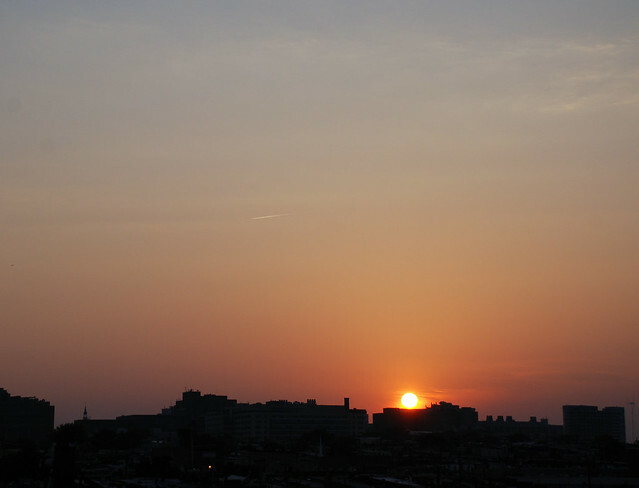 And as with any roof deck dinner, you can't forget to enjoy the sunset as an after dinner treat. What summer foods have you been cooking up lately?